Founded in the mid-16th Century by Spanish navigators, Los Cabos has slowly evolved through the centuries into what is today- an elite vacation destination boasting just the right combination of natural wonder, local allure and modern luxury. 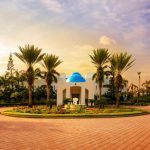 Comprised of two towns, the more cosmopolitan Cabo San Lucas and the quaint San Jose del Cabo, both offer a California vibe fused with true Mexican charm. 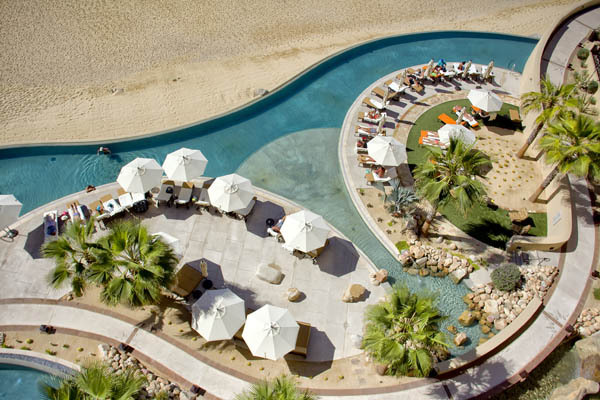 Here, dramatic landscapes await where the crystal waters of the Sea of Cortez meet the turquoise waves of the Pacific. Dotted with private coves along a curvy coast of pale sand beaches, Cabo offers a plethora of activities, from championship golf courses, sun-swept beaches, sport fishing and world-class shopping along with an excellent array of resorts spanning this sparkling coastline. 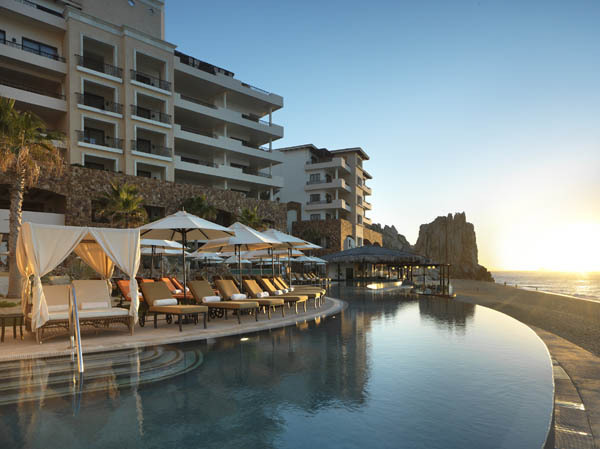 Among these spectacular retreats is the Grand Solmar Land’s End Resort & Spa, nestled between cliff and sea, and perfectly situated at the tip of the Baja Peninsula in a well-regarded area known as Land’s End. 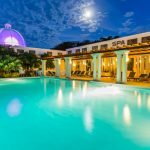 Set against the ethereal background of the Pacific Ocean and a massive natural rock formation, this hacienda-style resort features a captivating open and free flowing design that was built to complement its breathtaking surroundings. Recently renovated, the expansive lobby and common areas are decked with sumptuous wooden details, ornate chandeliers and rustic Mexican décor. 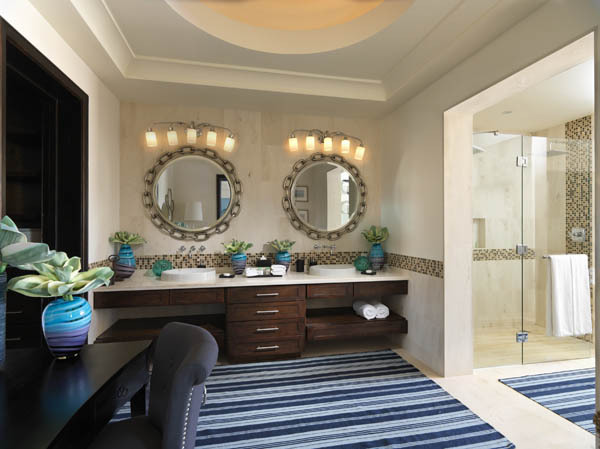 Classic-luxury meets modern elegance, Grand Solmar caters to its guests with impeccable service and all the premiere amenities that one would expect at a luxury resort. Subterranean stone passages open to infinity pools framed by cactus gardens and winding pathways. 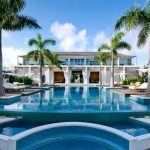 However these seven swimming pools traverse 9 buildings that are artfully divided into distinct cabana and lounge areas which are spread throughout the grounds where you never feel overcrowded, but perfectly relaxed in a paradisiacal setting. The 246 suites, ranging from Grand Studio to Four Bedroom Penthouses are spaciously elegant and outfitted with wooden and handcrafted furniture designed by Mexico’s finest artisans and adorned with ironwork and bright orange accents, complete with dramatic private stone terraces that face the ocean from where you can enjoy the fresh Pacific air. 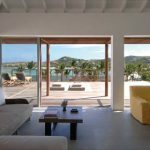 Each suite is equipped with a full kitchen including stainless steel appliances, and generously sized bathrooms that are simple and sleek with Spanish tiling. You can even enjoy a calming bath in one of the oversized tubs. 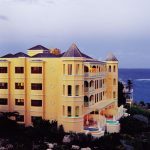 Outside, the main infinity pool with Jacuzzi and swim-up bar commands stunning views of the ocean. Reserve a poolside cabana which literally sits on the widened shallow pool ledge to feel like you are truly in heaven. If you’re still seeking an extra dose of luxury, step out of the sun and into the Sea Spa at Land’s End for a replenishing experience. A treatment here is worth the trip alone. The cabanas were carefully built directly within the cliffs so you feel one with nature as you climb up the steps leading to these elevated cabanas which open up to immaculate views of the majestic cobalt blue ocean. The sounds of the crashing waves and cool sea breeze set the stage for a heavenly pampering session. The therapeutic treatments include ancient healing and natural plant oils, sea salts and organic ingredients. Afterwards, the sensory journey continues with a sampling of healthy spa rejuvenating snacks in the lounge area. For those seeking more active options you are just a short walk from the lively downtown area where you can explore restaurants, lounges, and clubs. Discover the nearby town of Todos Santos, about an hour drive, for a truly authentic excursion, which is filled with charming art galleries and quaint local shops. 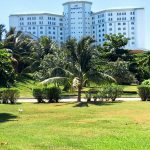 Back at the resort, you can partake in an endless number of land and water activities like deep sea fishing, kayaking, horseback riding, and sunset boat rides on one of the Solmar Hotel & Resorts own fleet of customized boats. 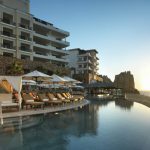 The dining options at Grand Solmar similarly do not disappoint and provide a full range of flavors and cuisines that you may not even want to leave this splendid resort. Sample a fusion of authentic Baja, American, and Continental cuisines at La Roca Restaurant or head to Don Luis Restaurant which offers Mexican and Baja Mediterranean flavors while weekly theme nights complete with live entertainment like a Mariachi Band, keep the menus exciting and interesting. Healthy dishes are available at Las Brisas along with fresh sushi. The plethora of bars and lounges provide easy access to savory snacks and cocktails throughout the day and evening. 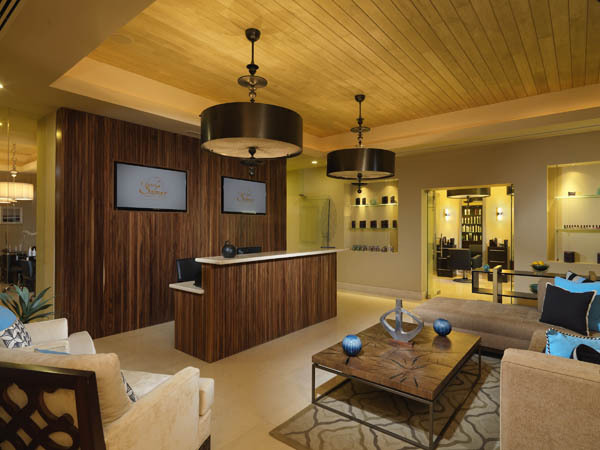 Regardless of your choices, you will leave Grand Solmar a refreshed and satisfied guest, which can also be said for all the Solmar Hotel & Resorts properties in the vicinity. 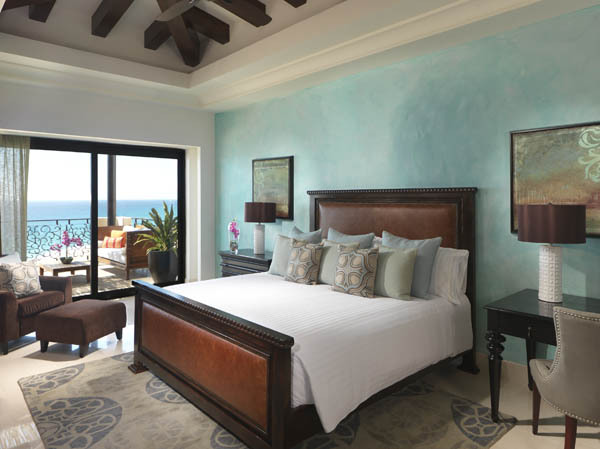 Its collection of five all-suite resorts provide options for every preference. 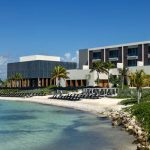 And in the near future there will be an impressive new addition to their stellar portfolio with Rancho San Lucas, a majestic exclusive, residential resort community being built on 835 acres of majestic oceanfront property. A destination worth waiting for.